Details of the clothing belonging to Amanda 'Milly' Dowler containing the DNA of a mystery man have been revealed by police. Surrey detectives said the DNA - possibly from sweat - was discovered on a corset-style bodice found in the teenager's bedroom. Murder inquiry officers revealed in February the DNA had been matched to a sample found on a coffee cup following a burglary at a church in Sunderland - 300 miles away. A Surrey Police spokeswoman said 55 men connected with St Paul's Church, in Ryhope, had now given swabs but they had been unable to identify who the DNA belonged to. Detectives said the corset-style bodice was bought from New Look in September 2001, for a Hallowe'en party. The top was found in Milly's bedroom at her home in Walton-on-Thames and could have been bought from the New Look shop in Kingston, Surrey, but it is believed she never wore the garment. Police believe the DNA match could be a coincidence. One theory is that the top was originally sold in Sunderland but was taken back to the shop and redistributed to the south of England. The other possibility is that Milly knew the man. A spokeswoman for Surrey Police said the person who left the DNA must have handled or worn the top at some point. She said: "We are not saying that person whose DNA is on the top is the suspect, but equally they could have information that is useful to us. "We have released this information in the hope it might prompt someone to come forward." 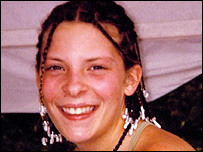 Milly disappeared while walking home from school in Walton-on-Thames, Surrey, on 21 March 2002. Her remains were discovered in Yateley Heath Woods in Hampshire on 20 September. Milly's funeral was held on Friday, a year to the day after she went missing.